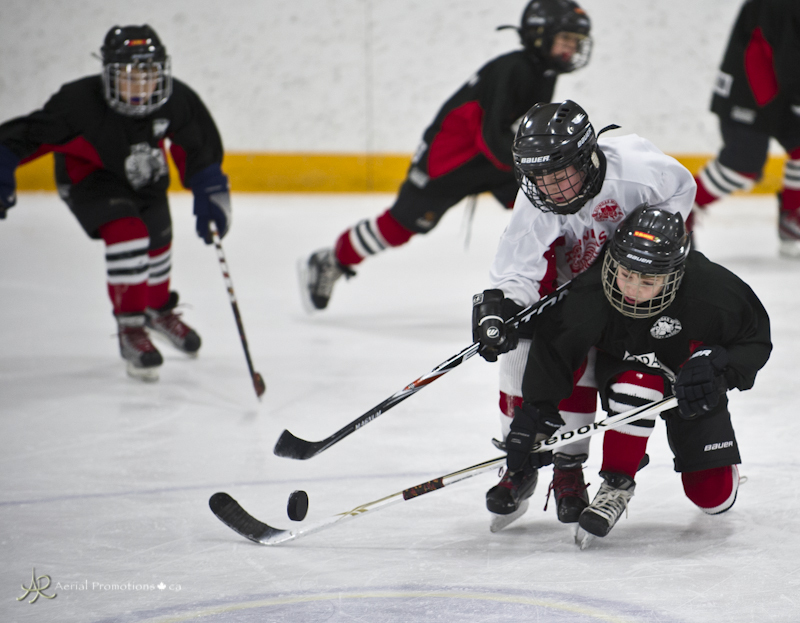 Hockey Alberta announced there will be changes to Novice hockey for the upcoming season. Most of us don’t like change, but studies in hockey have proven half ice practices and games for young seven and eight year old players is beneficial. Starting this season all games and practices will be half ice. Here is an outline of the changes from Hockey Edmonton. Other associations, specifically rural ones with smaller groups, will have some flexibility to ensure they can ice teams. Some teams might comprise of both seven and eight year olds, but in bigger centres, you will see seven year olds play with seven year olds (novice minor) and eight year olds play against eight year olds (novice major). Keep in mind, hockey associations east of Manitoba have had one-year age groups for decades. Your son or daughter will not have their development stunted by playing against children their own age. I’ve long wondered why hockey has little kids playing on the same dimensions as adults. This doesn’t happen in other sports at a young age, and in Europe and the United States they have been using half ice games and practices for young kids for a while. You can read and watch in this article how half ice has benefited kids in the USA. Or you can read and watch this video from Hockey Canada. Many have trepidation about the change, which is natural. No system is perfect, but I think if you give it time you will realize this is a smart move for Hockey Alberta. The change to half ice will increase ice time for kids. Teams, when possible, will be comprised of 18-20 skaters. When team A plays team B, half of team A and team B will be on one half of the ice while the second half of teams will be on the other half. Shifts will be 90 seconds. Kids will be on the ice much more than before, they will touch the puck more, and should become more comfortable playing in smaller spaces, which is how much of the game, as players grow, is played. In 2013, I had the pleasure of speaking with George Kingston about hockey development. Kingston has long been considered one of Canada’s best developmental coaches. Below is part of an article from 2013 with his views on half ice practices and games. I think this will be a good change. Although I’m not in agreement with everything about the change, mainly Hockey Edmonton’s decision not to keep score. Kids are smart. They will know what is going on, but not keeping score might calm down some of the overzealous parents in the crowd, so we’ll see how it goes. Ultimately, I’m nitpicking by not liking that change, but I strongly agree with the change to half ice. I do love the fact Hockey Edmonton won’t be handing out participation medals anymore. I don’t believe it sends the right message. Why get a medal just for showing up? There is nothing wrong with earning it, and if your child doesn’t get one from a tournament the kids will be fine. I find it is often the parents who are more worried how their child will handle not getting a medal, than it is the child being upset. I find it a bit odd, however, that they don’t want participation medals, which is good, yet they eliminate keeping score. But I digress. The main focus of these changes in Novice is moving to half ice, and I think once people get over the initial shock, they will see this was the right move. Here is a study Hockey Alberta did on how smaller ice surfaces will benefit your child’s skating, not hinder it. I realize some rural teams will have a challenge icing teams of only seven and eight year olds, but they will have the flexibility to move kids up or down to ensure they ice a team. You can ask your association about it, or talk to Hockey Alberta. The one important aspect parents should watch for is to ensure the coach of your novice team, or any team for that matter, is incorporating the proper practice plans/drills, which are available online, to ensure all young kids are getting quality coaching. That is crucial at a young age. As a parent, take the time to look at the drills available. If you are coaching, ensure you take the time and be prepared at practice. Your players will enjoy practices much more, as will you, and there are many great drills you can access on line. It’s a change for the better. My daughter fits into this change, so I’m approaching it from that perspective. Many of the parents have their kids going into ‘pond’ hockey leagues outside Hockey Canada for the exact reason that smaller ice is better for their child’s development. More puck touches, more stops, starts and turns, less straight line hockey is better. It forces the kids to learn to protect the puck and pass better. It’s true that it limits the ‘rule’ learning — offsides, icings, etc. But I’m unconvinced that will make any difference whatsoever to an Atom player’s development in their 9 year old season. As I mentioned on Twitter, this is such a great move. My son is 16 and played MAAA last year. I coached him from Novice to Bantam, and for the first few years of hockey, it is mostly the fastest kid on the ice getting the puck and out-skating everyone and going in on a breakaway. I was at the rink last night watching a 4 on 4 spring game. Same thing. Most of the 1:15 shifts were one kid skating the puck down a full sheet, or if they cleared the puck, 8 kids skating after it. Such a total waste of an ice time. The other by product is the good skaters will have to learn to play in traffic and stickhandle which they don’t presently have to do because they get the puck and hit open space. For the weaker players, on a full sheet they would never touch the puck, and if they were a little passive, the only time they would touch the puck is if it came to them. In a small area, they would have to be engaged just by the nature of the surface. My youngest son played half ice last season. I can assure you, small ice surface or large ice surface, in the novice and younger age groups only 2 or 3 kids will consistently touch the puck during game play. The only real player development at these age groups happens during practice times when every one has equal opportunity to have the puck. This is not an uneducated comment my youngest is my fourth son to play hockey. And this is especially true in smaller hockey associations that have a much broader range in abilities one one team due to the inability to tier their players. In closing more practice slots vs game slots at these ages is crucial and the best way to develop younger players. If you worked on it and practice and kids got better, then playing in half ice wouldn’t they then touch puck more than in full ice, since they are closer to play? Agreed practice helps for sure, but smaller ice has been proven to help, more than hinder, young 7 and 8 year olds. In theory. I do like the shifts at 90 seconds. Too many coaches I have seen just change lines at the next whistle. Not exactly good. It’s not perfect and I understand the concept of smaller ice surface, I always thought full sized nets for the little ones was ridiculous. There is lots to like about the changes, other then the score keeping. Small area gameplay can also be achieved in practice a lot easier then simulated in gameplay. The major minor age grouping is nice, except this year I will have 2 novice teams lol. Spring leagues (another different ball of wax) use birth years all the way through. And an alternative hockey league (HSL) is using a “graduated system” where age does not dictate what age they play against. Lots of different ideas on whats best for player development out there. I find the quote about how many seconds on average that a player touches the puck to be significant and it doesn’t seem to me in my experience that it increases exponentially. Worked here on the island, with the kids anyways. Parents hated it but the kids had a great time. I’ll be impressed if this change means the kids get to play/practice more for the same amount of money, or fees are reduced. Theoretically, this is what you’d expect after all – if there are 4 novice teams right now, they need to book two hours of ice to play. If they are playing cross ice, they should be able to play simultaneously. Is this the case? My only knock on this is icings and offsides. The ice may start looking like a gymnasium floor, in order to teach these things in a half ice game. Do the Flames count as novice hockey? Now parents can’t get to know each other like they would at a full game . And they have gotten rid of the score clock . Everyone’s a winner but Real Life doesn’t work like that .